The recommendations in this article were selected after performing detailed analysis of the various options available, and I have provided links for you to buy from Amazon. As an Amazon Associate I earn from qualifying purchases. This means I may earn advertising fees if you follow the links to Amazon and make a purchase. Submitted by Jason Horton on Tuesday, December 16, 2014. I originally wrote this roundup of the best DIY home security alarm systems back in April of 2013, however a lot has changed since then so I've reviewed the market again to find which home wireless systems are the best ones to consider as we move into 2015. 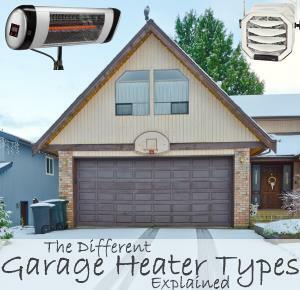 By reading through my overview of each of the alarm systems below you should be able to get a good idea of which one will best suit your needs. This was the top selling wireless alarm system on Amazon in 2014 and it's not hard to see why. If you live in an apartment and you just need a basic system for protection without spending too much then you really can't go past the GE 51107. You will also need three AAA batteries to power the system. 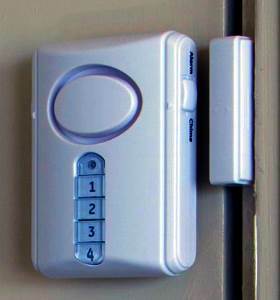 You mount the door alarm on the inside of your entry door along with the sensor as seen in the picture on the right. When you leave home you put the alarm into "Away" mode and then you have 45 seconds to close the door. Upon re-entering you have 30 seconds to enter your code to disarm the alarm. The three window sensors are in two parts - the smaller piece attaches to your window sill, and the larger piece is attached to your window frame. If the window is opened while the system is armed then the alarm will go off. 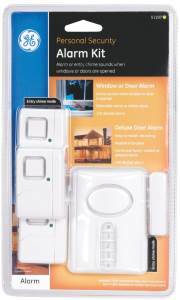 Both the alarm and the window sensors can be attached with screws or you can use the double sided tape which is included in the kit - the tape is a good option if you're renting and don't want to leave holes behind. The alarm sounds off at 120 decibels which is more than loud enough to attract the attention of neighbors and send the would-be burglar running. One of the easiest systems to install. No ability to monitor - if the alarm goes off while your away you'll have no idea. Easily disabled - a burglar will easily be able to identify the alarm attached to the door and remove the batteries or just smash the alarm due to its light weight construction. My personal recommendation is only chose this one if you're on a tight budget and you have neighbors that won't mind attending to it in the event of an alarm while you're not home - you can give a trusted neighbor the PIN so they can disarm it. You can get the latest price from Amazon.com. 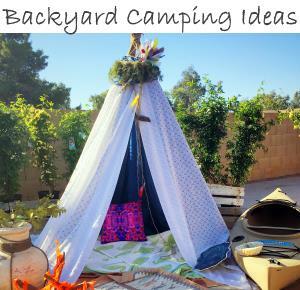 It's very popular and has hundreds of customer reviews. 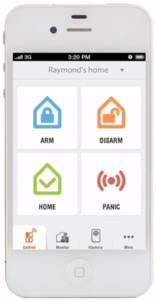 iSmartAlarm is a relatively new entrant into the wireless alarm market, but a very popular one. Last year they raised funds through an indiegogo campaign where they set out to raise $50,000 but actually ended up with $226,074! 2014 was a great year for iSmartAlarm where they were able to swing into full production and are ending the year with this being the 3rd most popular wireless security kit in Amazon's Home Security Systems category - I predict the iSmartAlarm iSA3 will rise to at least the second spot in 2015. Check out the video for a good overview of this kit. The CubeOne central hub is the brains of the system - it connects to your internet router via WiFi and it monitors all the sensors as well as connecting to your smartphone app for external control. It also sends text messages or makes phone calls in the event of an alarm. Up to 99 sensors can be connected to it including an optional extra camera which can send you pictures of what's happening inside your home. 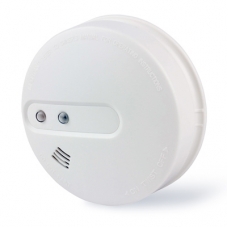 The motion sensor has a range of 30 feet and the 2 remote tags can be attached to a key-ring and notify the system when they leave home and when they come back again - you can set up alerts to notify your smartphone when that happens. You have to download the app separately but it runs on both Android and iPhone - the download instructions come with the kit. Best value entry-level wireless kit currently available. You can configure multiple phone numbers to be contacted when the alarm goes off. Can be easily expanded with additional sensors. Can't be used with independent 3rd party monitoring services - not to be used to automatically contact the police either. The optional extra camera can be difficult to properly configure as CNet pointed out in their review. The phone alerts only work in the USA and Canada. I personally believe the iSmartAlarm kit is a much better option than the GE 51107 above due to it's expandability, and most importantly, your ability to monitor the alarm via your smartphone. You can get the latest price at Amazon.com. 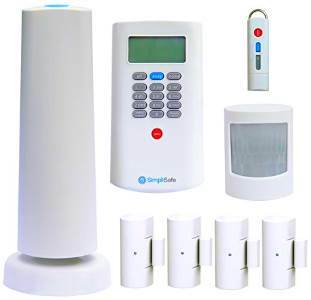 Unlike the options discussed so far, what sets the Simplisafe2 kit apart from the other DIY security kits above, is that they offer the optional extra of having 24/7 remote monitoring - although this isn't included in the standard price of the kit it's only $14.99 per month and you can opt-out at any time. The base station can monitor up to 41 different censors and has a backup battery which lasts several days in the event that mains power fails - cutting the power to your home won't immediately disable the alarm. By keeping the keypad and base unit separate remote monitory security is enhanced - in the event that a burglar try to disable the system by smashing the keypad, the base station will first silently send notification to the monitoring service and only after that's done it will sound it's 85 decibel alarm so even if the burglar stops the alarm from that point it's too late - the monitoring service has already been alerted. Although it does come with an app which lets you remotely set the alarm, the apps for iPhone and Android are only available if you subscribe to the monitoring service. You can also buy additional units of everything included in the basic kit. 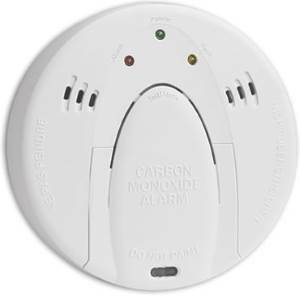 Easy integration of Smoke & Carbon Monoxide Detectors. The option to have remote 24/7 monitoring. Added security of notifying the monitoring service silently before sounding the sirens. No remote monitoring and no app unless you subscribe to their $14.99 per month service - if you want the ability to monitor yourself then you'll have to chose a different alarm system. The Simplisafe2 8 piece kit offers excellent value and you can get the latest price and thousands of customer reviews at Amazon. 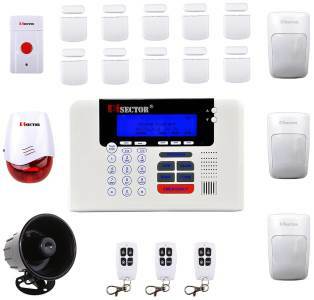 This kit can be configured to send you a text message and call a series of numbers in the event the alarm is triggered giving you the option of self monitoring, subscribing to a third party 24/7 monitoring service, or indeed doing both. I rate this as one of the best DIY alarm systems for homes because of its high level of versatility and great value for money. But you don't have to take my word for it, there are hundres of customer reviews with the vast majority being positive. As an example of its flexibility, every zone (wired and wireless) can be independently set, armed, and disarmed. But you don't have to do them separately, it also has a 'one-key arm' feature as well. In the event that the mains power is disabled or the phone line is cut, the PiSector GS08-M can run off it's battery back up and still contact you and/or a monitoring service via 2G, 3G, or 4G wireless phone networks - that's much more redundancy than the other systems discussed above. PiSector offer great customer support should you have trouble with the installation. You can monitor it yourself or subscribe to a remote 24/7 monitoring service. High level of flexibility and large number of zones that can be independently monitored. Multiple levels of redundancy for remote monitoring. All the additional flexibility of this system means that it costs more than the others I've talked about above. 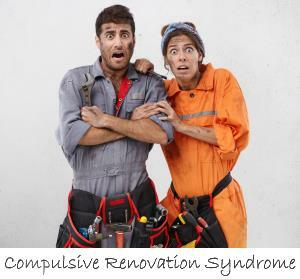 Doesn't have a compatible Carbon Monoxide Detector in the range of available sensors at the current time. PiSector have done an excellent job of packing many high-level features as possible into this alarm kit, for example you can also set it to trigger the wireless siren if the phone line is tampered or cut. Click here for the latest price at Amazon.com now. Over the last couple of years the number of features that have been added to some of the better DIY home security system kits means that they are now highly competitive with the systems installed by professional security companies. One important point: just remember that if you are buying a system which uses the cell phone network then you will have to supply your own SIM card. You will also need to supply batteries for all the wireless sensors. If you have any questions or suggestions please use the contact form to reach me. Do you know of any alarms that can dial out like a cell phone? Submitted by keith on Saturday, April 13, 2013. It seems that most alarm systems use a standard phone line to dial out, but are there any you can recommend that use the cell phone network instead? This would be better because then nobody could cut the phone line to the alarm. Submitted by Jason Horton on Sunday, April 14, 2013.